Through the flatlands south of Champaign, Illinois, County Road 1200 cuts a ruler-straight line, one of those byways in the American Midwest so devoid of curves that steering is almost optional. Heading south, one passes fields of corn, wheat, and soy, all neatly framed by telephone poles that stretch to the horizon. In this monotonous landscape dominated by horizon, one field stands out from the rest. 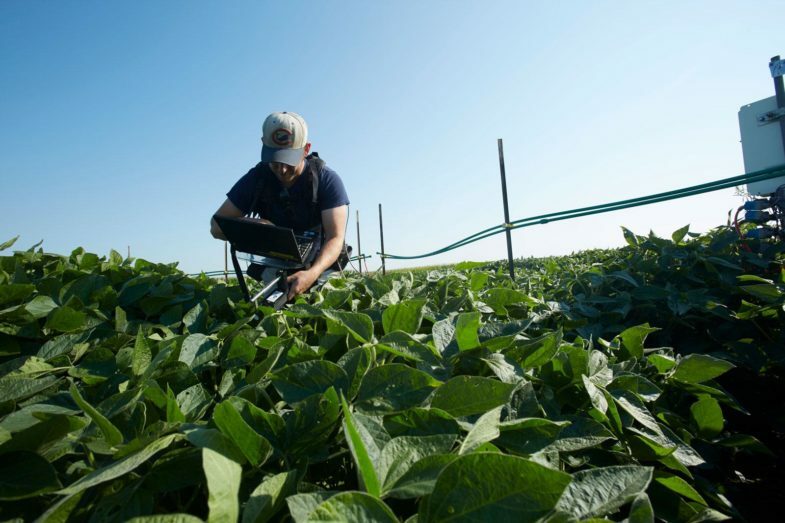 Behind a weathered gray barn, a circle of 8-foot-high white plastic pipes rises suddenly over rows of thigh-high soybean plants. It’s a jarring sight—a kind of modern-day technological Stonehenge. Welcome to one of the surprising frontiers of climate change research. Dozens of circles like this adorn farm fields in the U.S., Japan, and Australia, part of a sprawling international study on climate change. For more than a decade, these pipes and the slender green hoses that lace them together have been pumping carbon dioxide gas into the air near their target crops. Outside the pipe circle, plants grow under present-day climate conditions; inside it, they’re bathed in air that simulates the predicted atmospheric conditions at the end of the 21st century, when global levels of CO2 could increase by nearly 40 percent, rising from today’s 400 parts per million to more than 550 parts per million. The broad effects of climate change and global warming are by now well known: melting glaciers, rising seas, shifting patterns of drought and rain, increases in vector-borne and waterborne infections, species extinctions. But the specific effects of climate change on human health are just beginning to emerge. At the Harvard Chan School, climate change research ranges from studies of how land use and building materials interact with airborne pollutants to how powerful new computer models can tease health trends out of massive environmental and health insurance data sets. With this wide perspective, investigators are building on the School’s legendary research on air pollution, from Alice Hamilton’s exploration of industrial spaces in the 1910s to the pioneering Six Cities study, which tracked the effects of urban air pollutants throughout the 1970s and ’80s. Together, the School’s researchers are helping prepare the world for a future where climate is forecast to be the number-one threat to public health. The experiment planted along County Road 1200 has already led to a startling scientific yield, as described in a 2014 study in Nature. When exposed to high levels of CO2, staple crops like wheat, rice, maize, and soybeans shift their internal chemistry and retain fewer essential micronutrients, such as the minerals zinc and iron. That’s a frightening fact, says Sam Myers, principal research scientist, planetary health, in the Exposure, Epidemiology, and Risk Program in the Department of Environmental Health, who led the crop study. Today, 2 billion people worldwide suffer iron and zinc deficiencies. Both minerals are crucial to human health: zinc for a fully functioning immune system, iron to form a key building block of hemoglobin, the molecule that transports oxygen around our bodies. If global emissions and concomitant climate change continue at current rates, by 2050 hundreds of millions of people who depend on these staple crops for nutrition—especially in poorer societies where meat is rarely consumed—could suffer devastating health problems, from stunted growth to diminished cognitive function. While most climate change research has focused on outdoor air, most people in the Western world do not spend their days under open skies. 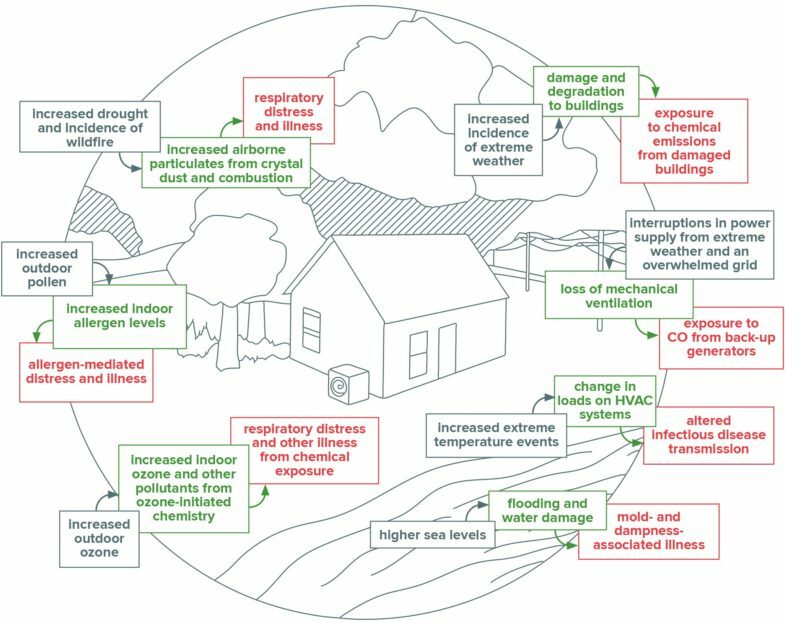 Many are indoors for most of their waking hours—and new research is showing that indoor air quality is not immune to the deleterious effects of global climate trends. Picture an average suburban home just before move-in day. The walls are freshly painted, the wall-to-wall carpeting is spotless, the wood floors and kitchen cabinets gleam with a polyurethane finish. For the young couple backing their rental truck into the driveway, it looks like a perfect place to raise a family. Yet lurking beneath the handsome surfaces are dangers the new owners can’t see. “There’s a TV ad that shows a young father sitting with his kids on a couch. The kids are spilling stuff all over. The father is not worried because the couch has a stainproof coating. What he doesn’t know is that stain guard is made of dangerous fluorinated compounds. The kids are sitting on it, they’re breathing it, and it’s getting in their bodies,” says John D. (“Jack”) Spengler, the Akira Yamaguchi Professor of Environmental Health and Human Habitation and director of the Center for Health and the Global Environment. Climate change exacerbates the peril. Toxic fumes and carcinogens often leach out of common materials used in furniture, paint, and construction. Alone, these chemicals include known carcinogens, asthma-inducing substances, and endocrine disrupters, posing significant health risks. Set against a backdrop of climate change dynamics, their impact can be worse. As Spengler explained in his 2011 book Climate Change, the Indoor Environment, and Health, pollutants such as ozone (O3), which are tied to a warming climate, react with common indoor chemicals, from paints and varnishes to cleaning supplies, creating a dangerous one-two punch. “Any cleaning product that has a pine scent or a lemon scent puts out chemicals called ‘terpenes,’ which react very quickly with ozone,” creating gases like formaldehyde that can irritate the lungs and nasal passages, Spengler says. The chemical reactions can also create tiny airborne particles—essentially free-floating clusters of molecules made from a variety of substances. These secondary pollutants’ minuscule size lets them penetrate deeply into the lungs, enter the bloodstream, and cause widespread inflammation that undermines cardiovascular health. Most directly, as the global climate continues to warm, a growing number of people will be forced inside to avoid oppressive heat. “There will be many areas of the world where you cannot be outdoors for extended periods. It will be 30 to 40 degrees Celsius [86 to 104 degrees Fahrenheit] for long periods of time,” Spengler says. Spending more time inside increases one’s exposure to a different cast of airborne pollutants: dust, pollen, mold, and gases that leach out of building materials, forming a potent cocktail of indoor contaminants—one that older ventilation systems may not be equipped to remove. According to Spengler, the solution to these indoor air woes is two-pronged: reduce the emissions that drive climate change and eliminate offending indoor materials. With those goals in mind, he has helped Harvard launch an initiative to use only hazardous-chemical-free materials in all buildings campuswide, and has worked with major corporations—from Kaiser Permanente to Google—that are following suit in their buildings in the U.S. and abroad. Hopefully, these initiatives will ripple beyond the walls of individual companies, Spengler says. 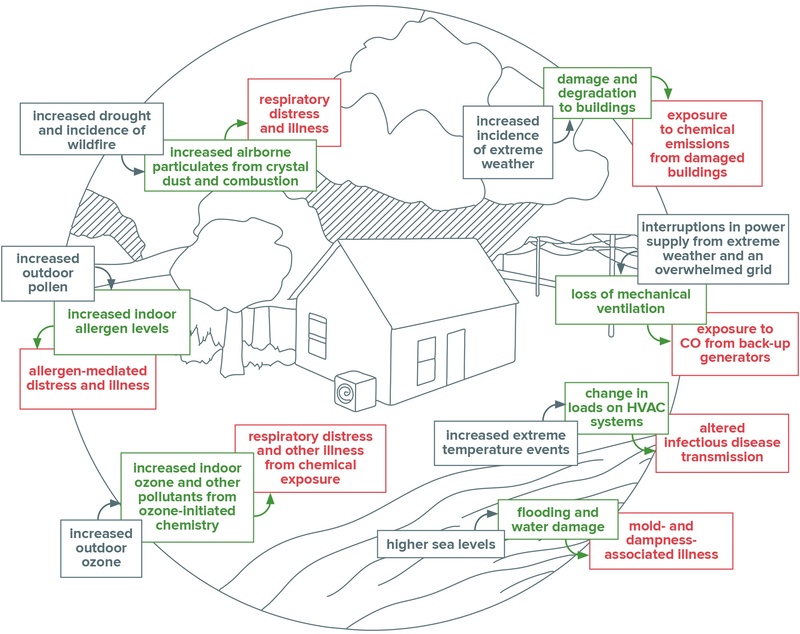 Global warming, intensified weather events, and other effects of climate change may affect buildings and the health of their occupants through many different routes. 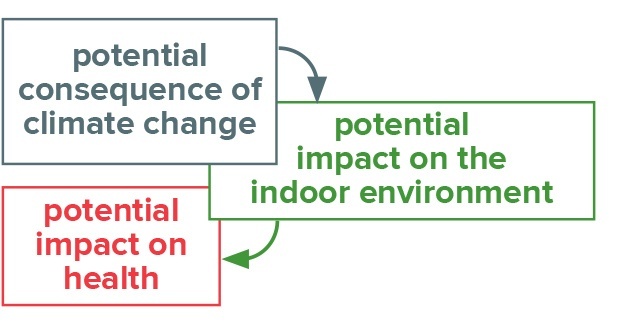 Source: “Climate change, indoor environments, and health,” Indoor Air, 2012. The good news, at least in the U.S., is that energy and transportation emissions are down compared with 50 years ago, thanks in part to regulations like the Clean Air Act of 1970. Developing countries such as India and China, however, are burning fossil fuels in record amounts, spewing greenhouse gases and dangerous particulate emissions from vehicles and coal power plants. Fortunately, these nations are also looking to the future. In late 2016, India released a plan that aims to generate 60 percent of its new energy from nonfossil fuels within the next 10 years—a major shift in a nation currently powered by coal. And over the past decade, China has passed emissions standards for new vehicles that are modeled on European laws and has ramped up emissions controls at shipping ports nationwide. China has also expanded its use of hydroelectric, solar, and wind power, with the goal of generating half of its new electricity from renewables by 2020. Indeed, now that the U.S. has pulled out of the Paris climate agreement, China is poised to take a leading role in developing renewable energy sources. 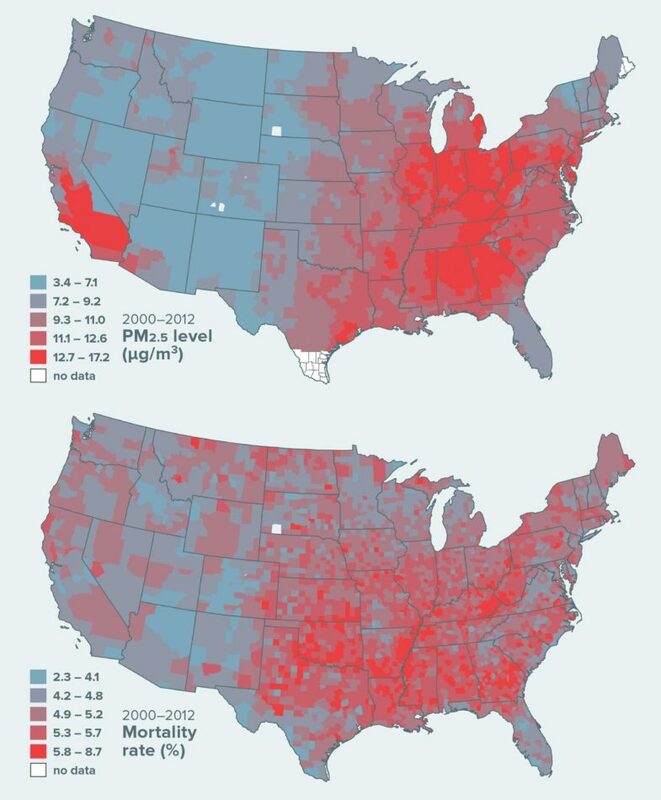 The county-level map at top shows exposure levels to fine particulates among Medicare beneficiaries. The map at bottom shows all-cause mortality rates among Medicare beneficiaries. Researchers have concluded that long-term exposure to PM2.5—fine particulates that are increasing with climate change—raises the risk of death, even at levels below current national standards. There may be no safe level of exposure to PM2.5. As nations worldwide start to tackle these challenges, each one faces an important question: In light of the intricate feedback loops between climate change, air quality, and human health, how should policymakers best intervene? Francesca Dominici is answering that question with a level of detail that until recently was unimaginable. Co-director of the Data Science Initiative at Harvard University and professor of biostatistics at the Harvard Chan School, Dominici is harnessing information from dozens of publicly available sources and spinning them all into a massive database. It holds roughly 30 terabytes of data (for comparison, the average laptop hard drive holds less than one terabyte) and uses an array of more than 100 powerful computers working in parallel to sort through it all. The result is a data science research tool set of unprecedented scale and rigor, linking daily air pollution data for every ZIP code in the continental U.S. with Medicare billing claims, weather information, and variations in power plant emissions. Deploying sophisticated statistical techniques and data covering almost 97 percent of people age 65 and older in the United States, this work will advance solutions for greenhouse gas and air pollution control—not just at the national level, which would require political commitment from Washington, but also at the state and local levels. By superimposing Medicare data onto pollution measures, Dominici can see not only how levels of air pollutants in a given location change over time but also how the health of its residents responds. “We basically process 480 million medical observations. We have every single diagnosis for every time a hospital treated, say, your grandfather. And we know the level of pollution that your grandfather has been breathing in his neighborhood over the last 15 years,” she says. In some regions, she’s found, exposure to tiny particulates—even at levels lower than the standards set by the U.S. Environmental Protection Agency (EPA)—has triggered a clear rise in deaths from cardiovascular disease. “That means current National Ambient Air Quality Standards need to be lowered further, at a time when the national administration is saying, ‘no more regulation,’” she says. Dominici informally calls her data-driven approach “precision public health,” because it enables researchers to see the impact of air pollutants on a hyperlocal scale. The model pinpoints individual neighborhoods that are at risk, enabling governments to focus their existing public health interventions more effectively. “We can identify the census tracts where officials really have to pay attention, and even identify residents who are most vulnerable due to pre-existing health conditions,” she says.